Updated Thursday January 22, 2015 by Sources: Little League and SportsBusiness Journal/Daily archives, All Photos by Little League. 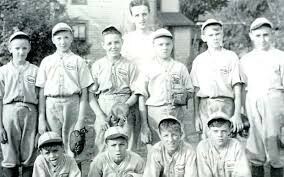 ■ On June 6, the first Little League game is played in Williamsport, Pa. A $30 donation is sufficient to buy uniforms for each of the first three teams, named after their sponsors: Lycoming Dairy, Lundy Lumber, and Jumbo Pretzel. ■ Little League founder Carl Stotz designs the Little League logo. ■ Mac McCloskey builds the world’s first remote-controlled electronic scoreboard for use at the original Little League field. ■ Eleven teams participate in the first Little League World Series, then known as the National Little League Tournament. ■ U.S. Rubber (now Uniroyal) becomes Little League’s first corporate sponsor. The partnership between the maker of Keds and Little League led to the development of rubber-molded cleats that are still used today. ■ Peter McGovern is named the first full-time president of Little League. ■ The Little League World Series is televised for the first time, with CBS providing the coverage. ■ Little League Director of Research Dr. Creighton Hale develops the double earflap batter’s helmet.